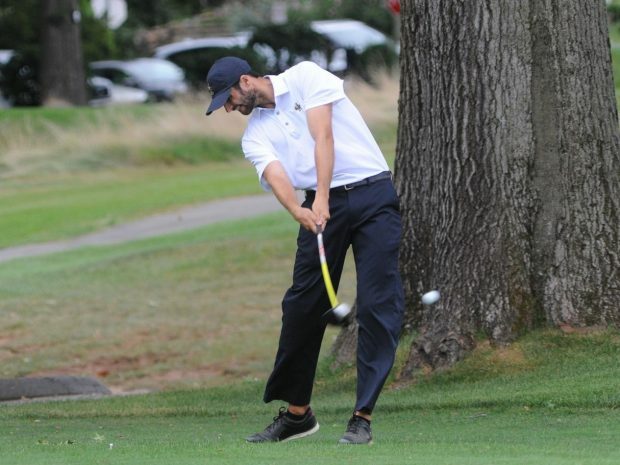 After starting the season in spectacular fashion by shooting a school record in the Bill Detrick Invitational at Indian Hill Country Club, the Bantams took their talents to the Duke Nelson Invitational hosted by Middlebury College. On Saturday, the Bantams got off to a bit of a slow start, making a few too many bogeys in the closing holes. Following day 1, the Bantams sat in a tie for fourth place after recording a team score of 296. Senior tri-captains Will Rosenfield (Baltimore, MD) and Taylor Kay-Green (Needham, MA) led the way for the Bantams, each firing a 73. Sophomore Ricky Leme (Lake Villa, Ill.) and senior Nick Branchina (Summit, NJ) each shot 75, with senior Joe Ladd (San Francisco, CA) rounding out the first round scores with a round of 80. After regrouping Saturday night, the Bantams hit the links early Sunday morning poised to make a charge up the leaderboard. The Bantams quickly moved up the leaderboard with a few opening birdies, climbing quickly into second place. However, the team cooled off as the round went on, and the Bantams weren’t able to climb any higher than second. Once again, Rosenfield continued his stellar play, firing a score of 72 to finish individually in fourth place. Kay-Green and Leme both shot stellar rounds of 73. Branchina followed suit, improving his Saturday 75 into a 74 on Sunday. Ladd once again rounded out the crew with a 77 in the final round. Despite a valiant effort and a team score of 292, the Bantams fell four strokes shy of the Williams College Ephs, finishing as runners-up. Next week, the Bantams will look to get their revenge on William’s turf as they travel to Williamstown, Massachusetts to compete in the Williams Fall Invitational. where they will seek to defend their first-place finish from last year.